Your Boxing Guard is more important than you think! Your boxing guard is more important than you think – don’t underestimate it! Your opponent’s boxing guard is a window to their fight style. You just need to know what you’re looking for. Remember this when choosing your own guard, and always switch it up – use a range of different guards – to keep your opponent guessing. For instance, at a first glance the following guards can indicate the use of certain styles (not that I can guarantee these, but it’s a good rule of thumb). – An in-out fighter, able to move forwards and back (don’t necessarily be fooled into thinking “basic guard” = “basic fighter”) It’s a stance most boxers use because it’s provides a great platform to punch and defend from. • Stay centred in this stance, use your feet to avoid punches, and stay upright – don’t lean. • Keep your rear hand to your chin and your lead hand out in front. • Maintain a slight bend in your knees – for better movement. • Keep your chin down and your eyes on your opponent. • Have your rear foot out to the side and not directly behind your front foot, this will keep you balanced and prevent you falling over your own feet. – A come forward fighter, who just wants to get into range and annihilate you with a storm of punches. They keep their hands up high to protect their head. They’re not afraid to come forward and take a few punches on their gloves in order to get some power shots in on you. • Stay centred in this stance, use your feet to avoid punches, don’t lean. • Keep both hands up to block incoming punches. • Be ready to drop your elbows in case of body shots. • Only use this guard when you are at hitting distance walking your opponent down. – A boxer who’s confident in moving, their hand speed and their ability. By keeping their hand low and appearing to be an open target they will try and draw you in as they prefer to counter punch from this guard. Be careful though, if you don’t go to them, they are normally quite happy to come forward quickly and land jabs to rile you – bringing you forward anyway. • Stay centred in this stance. • You can lean to avoid in this stance, but make sure you know your limits and understand when you do need to move your feet. • Keep your rear hand to your chin and be ready to use it for parrying. • Use your low lead hand to fire in quick jabs to your opponent and set up combinations. • Try different angles of punch from your lead hand. e.g. lead hook, sneak punch, anything to keep your opponent on their toes. • Have a slight bend in your knees for better movement. • (in Orthodox stance) Practise throwing your right uppercut from this position, draw them in and “Whack”. 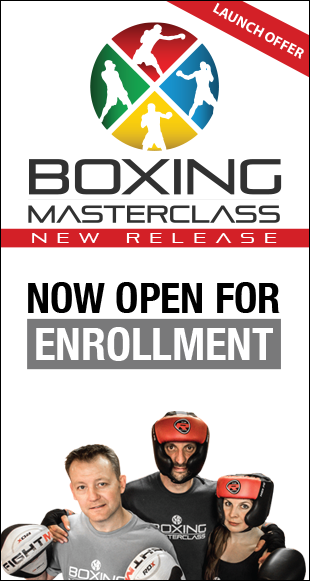 – Famously used by Mayweather to amazing effect, and great to use when you’re on the ropes. Mayweather seems quite comfortable in this guard wherever he is in the ring. Like the “low hand guard” boxers, they too will prefer to counter punch whilst being an impossible target to hit. • You can lean to avoid in this stance, but make sure you know your limits and know when you do actually need to move with your feet. • Protect your lower torso with your lower arm. • Keep a slight bend in your knees for better movement. • Tuck your chin into your shoulder and keep your eyes on your opponent. • When first trying out this guard, give it a go by leaning on the ropes and get a partner to fire in some punches. – This isn’t a guard you would use for the whole fight (it would be pretty awkward to move around well in this guard :-). That being said, I’ve seen some fighters in similar guards for most of a fight (but maybe not sat down so low). They will try and make themselves as small a target as possible. They will try and get in close, bobbing up and down in this stance to avoid your punches on the way in. • Use your knees to sit-down and keep your back straight. • Keep your hands up to protect your face. • Keep your chin down and keep your eyes on your opponent. – In a bob style to walk toward your opponent and avoid straight attacks. • Try this one in sparring by using the bob, don’t drop down as far as the picture shows, just enough to avoid a jab cross. Move towards your opponent avoiding his punches – you might be surprised how effective this is. 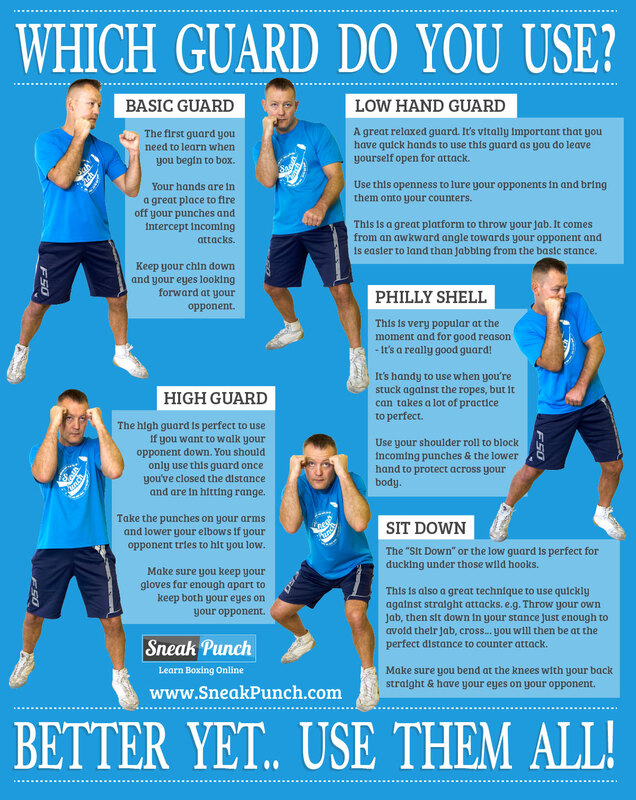 Which Boxing Guard Should You Use? So which is the best boxing guard for you? It’s completely your decision, but I would advise you to practise all of them and try them all out in sparring. Why should you learn them all? Because if you stick to only one guard that you find comfortable and that works for you in ring, there’s no guarantee that it will work well against every fighter. For instance, you could be using the “Low Hand Boxing Guard” you’ve got quick hands and you’re confident in your ability. Well, you can lose that confidence rapidly when you come against someone with quicker hands and faster movement. All of a sudden, your sure fire way of winning fights has been taken away from you and this is the time you need to adapt and overcome. This means you have to use your head and change your tactics and style to fit the fighter. If you don’t know any other guards or have only concentrated on one way of fighting, you are stuck. But in the above situation – if you can switch effortlessly, from the “Low Hand Boxing Guard” where you like to counter punch to the “Basic Boxing Guard” and start fighting in-and-out, then you’re still in with a chance. All of a sudden you’ve changed from being an open target and counter puncher to a well covered in-out-fighter – and you might be able to take advantage of the situation. The more variations and skills you have, the better. If you can mix things up and keep your opponent guessing, you are always better placed to win.